There is nothing quite like your first trip to Disneyland! 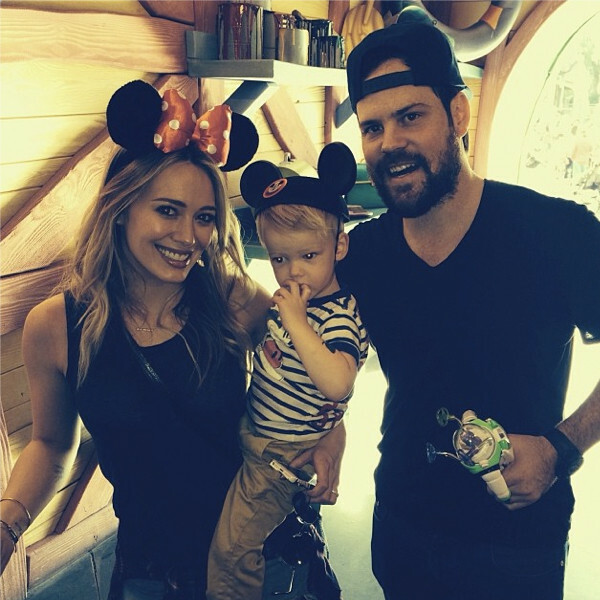 Hilary Duff shared on Instagram that she and husband Mike Comrie treated their precious son Luca to a trip to the Happiest Place on Earth on Friday, Dec. 27. “We braved Disneyland yesterday! Luca’s 1st time,” the former Disney darling captioned the sweet snapshot of the trio at the magical theme park in Anaheim. She added the cute pic on Saturday. The Lizzie McGuire actress wore a pair of Minnie Mouse ears, complete with the cartoon character’s trademark red bow, while her 1-year-old son donned a Mickey Mouse hat and matching T-shirt. The retired hockey player opted to keep his black baseball cap but held a Buzz Lightyear toy. The 26-year-old mama later showed off her Luca’s personalized mouse ears after their successful visit. As for expanding their family and giving little Luca a brother or a sister, the singer recently slammed reports that she and Comrie are trying to get pregnant with a baby girl.